Watch this video to answer the question How Often Should I Clean My Rugs? 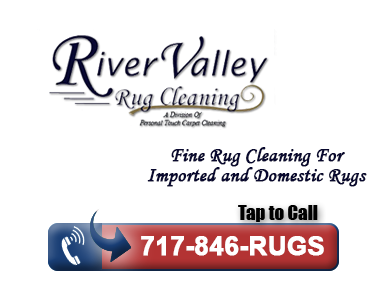 River Valley Rug Cleaning is a specialized division of Personal Touch Carpet Cleaning offering the most thorough cleaning for your oriental, area rugs, carpet, and upholstery in York. If you are searching for the right rug cleaner for your Oriental, Persian, Braided, Antique, Heirloom or any other Area Rug, I invite you to continue reading. Whether you acquired your rug oversees on your honeymoon, inherited it from a relative, or simply bought it at the store because it was the perfect rug for your room, we are here to help your rug last longer and look better. Hi, my name is Chad Landis, Master Textile Cleaner and Owner of River Valley Rug Cleaning. It is my hope that you find valuable information on our site to help you care for your rugs, get the most enjoyment out of them and locate a qualified Oriental rug cleaner in your area. If you are in South Central PA, we’d love to help you out. We are York’s first full service rug care studio offering full submersion hand rug cleaning, dry cleaning and hand sewn repairs. We are experienced in all types of rugs including hand knotted, hand woven, machine woven, braided, hand tufted, hooked, and designer rugs. We are also experienced in all fiber types from natural fibers such as wool, silk, and cotton, to synthetic fibers. You have your choice of over 50 carpet cleaners that service the York area and many of them are self proclaimed “rug experts”. We are York PA’s only Certified Textile Pro, IICRC Certified Rug Cleaner and WoolSafe Approved Service Provider. Our training allows us to safely give your rug the most thorough cleaning appropriate for your individual rug, not merely a steam cleaning or a quick automated machine that only clean the top of your rug. Your oriental area rugs will smell fresh and clean when you trust your rugs to the right cleaning professional. To learn more about our 9-Step Spa Treatment view our cleaning process.